In Making Camp, our first App for Android and iOS, coming very soon, players learn how the Ojibwe lived hundreds of years ago. They learn about the Ojibwe migration. They can earn points by watching videos about history or math and answering questions. They can also earn points by doing activities. More than 75% of these activities and videos have a Native American theme – but not all of them. There’s a movie on visualization that talks about growing apples. It also has a couple of superheroes. 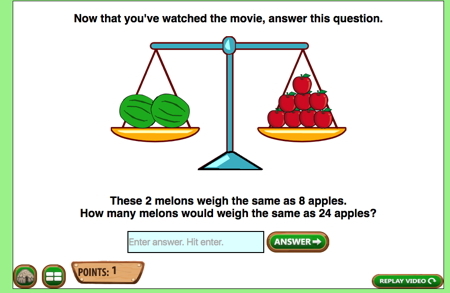 After the movie, they get this question which is very similar to something they might see on a standardized test. There is another video about math terms that includes a spaceship and zombies, definitely not a part of Native American history. Why do we do that? Why in another game coming out next year, Aztec, do we have activities where characters play a prank on another character by filling an entire barnyard with cats? Why does Forgotten Trail include snowmobiling, driving and shopping at the mall as well as canoeing and the tale of how the Ojibwe got the dog? This is that although Native American students and Latino students may have specific cultural stories, history and language they are also just plain old American (or Canadian) kids. They’re interested in things like driving and snowmobiling, pow-wows and swimming. 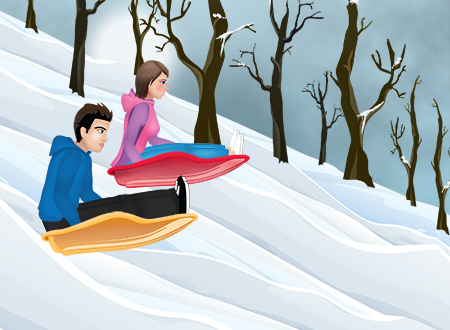 Both the suggestion for sledding and for deer hunting came from students on reservations in the Midwest. The suggestions about farming activities came from Latino students in inner-city Los Angeles. I didn’t know their stories but I got the impression they had come from somewhere rural, either in another country or in the US. It’s been several years since I taught middle school but testing the effectiveness of these games over the past couple of years I’ve gotten the opportunity to meet a lot of kids from around the country. It’s reinforced what I’ve always known – you can’t put people into little boxes. A girl might be a fancy dancer and go to every powwow but that same girl can still want a cell phone and check her Instagram account every hour. Some of our games, like Fish Lake, are 100% set in a historical period. However, even in those, if you missed the game challenge where you are computing how many deer you need to shoot to make it through the winter, you may find yourself watching the video that explains mixed fractions in terms of circles with various fractions shaded in. There are a lot of facets to every topic in math and more than one way to look at a problem. The same can be said for every student and so we have games with a lot of different parts.